George and Dragon01768 865381work InnThe George and Dragon is a stylish country inn with a cosy bar, and eleven comfortable bedrooms, individually designed and decorated. The elegant bathrooms have roll top baths or contemporary walk-in showers. 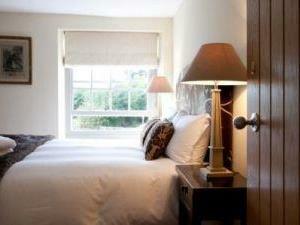 Ideally situated on the edge of the Lake District, in a lesser known part of Cumbria. Enjoy fresh, seasonal food, local ales and fine wines in our relaxing and welcoming restaurant. We grow and rear much of our own produce in our kitchen gardens and fields at Askham Hall, just a couple of miles away. We also source produce from local suppliers and farmers, many of whom live and farm on the family estate. 2014 Cumbria Life Dining Pub of the Year 2015 and 2016 finalist. 2016 Cumbria Life ‘Dining Pub of the Year’ finalist & Cumbria Tourism ‘Taste: Dining Experience’ highly commended. 2018 Family Business Awards Cumbria - Best Food & Drink establishment. 2018 Cumbria Tourism Taste Cumbria Award Finalist. Check-in times for rooms is from 16.00, check-out is 11.00. Food serving times are from 12.00 until 14.30 and from 18.00 until 21.00. Bar snacks available all day. Walkers, cyclists, families and well-behaved dogs and group bookings are all welcome. 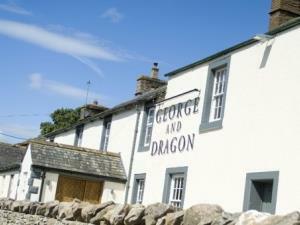 George and Dragon sometimes limits bookings to 2 or more days. Superior doubles are lovely rooms and are more spcaious than the standards. Hanging space, TV, DVD and radio. Located at the front of the building with walk in shower. Cot available. 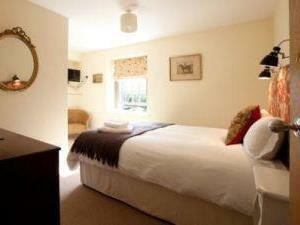 Single occupancy £99. Please note that if you would like to bring a dog please contact us to let us know. An additional charge of £10 is applicable and will be added to your final bill. 4 Superior Dbl sometimes limits bookings to 2 or more days. Located at the front of the building with large bathroom with free standing roll top bath with telephone style shower attachment. 5 Superior Dbl sometimes limits bookings to 2 or more days. Great food. Quality interior design and decor. Friendly helpfull staff. Position ideal if you want access to the motorway. Priced at higher end of market for similar comparable establishments . Private fishing, shooting and stalking on the owners family estate, can be arranged. Great base for walkers, cyclists as has great accessibility to the lakes, rivers and mountains of the Lake District. 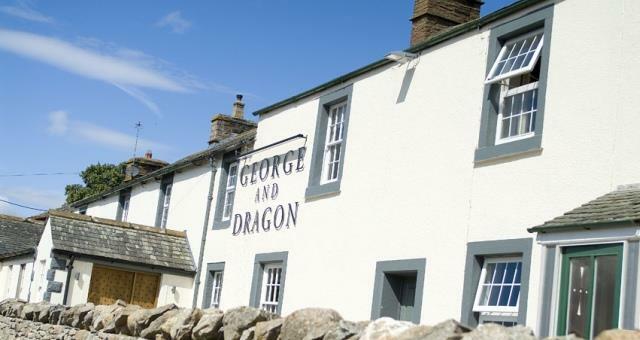 The George and Dragon is situated on the A6 in Clifton, just a few minutes drive from Penrith, towards Shap and 5 minutes from M6 jct 40. Regular buses from Penrith with a bus stop right outside. All bedrooms are upstairs and unfortuantely cannot install a lift as it is an 18thC coaching inn.